Spy DLL Remover: Detect & Delete Spy DLLs from the system. 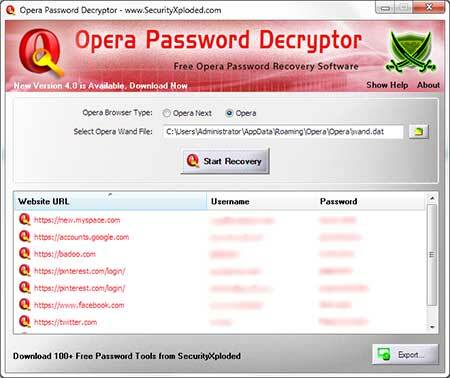 Opera Password Decryptor is the FREE tool to instantly recover the passwords stored by all versions of Opera browser. Like other web browsers, Opera also stores the username/passwords for websites visited by user. However passwords are stored only if the user opts to save password during authentication. This is very useful feature as it prevents user from hassle of entering password everytime. Opera securely stores the passwords along with username, website and other related information in the password file (wand.dat/Login Data) in an encrypted format. 'Opera Password Decryptor' can help you to automatically detect and decrypts all the stored passwords for all versions of Opera. Instantly decrypt and recover stored encrypted passwords from 'Opera Secret Store' for all recent versions of Opera. Provides support for recovering stored opera passwords from different system also.User can specify remote system's wand.dat file path to recover the passwords. Automatically discovers 'Opera Password File' (Wand.dat/Login Data) based on installed version of Opera. By default passwords are not displayed in clear text as it is sensitive information. However user can view the same using 'Show Password' option. Provides option to sort the displayed password list by username, password or website which makes it easy to search through 100's of stored account entries. 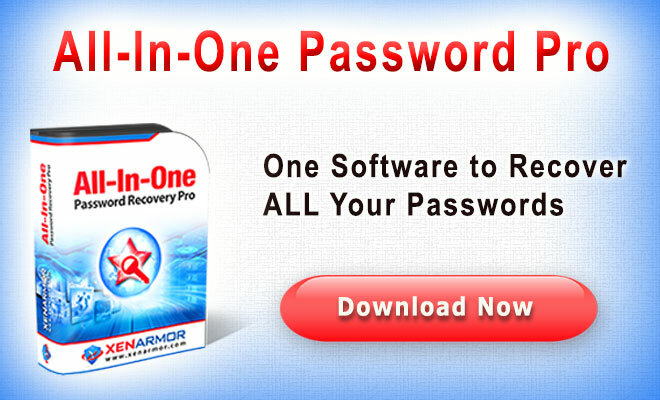 Backup the Recovered Opera password list to HTML/XML/Text/CSV file . Integrated Installer for assisting you in local Installation & Uninstallation. Opera stores the password in encrypted format in the file called 'Wand.dat' at its profile location. The Opera profile location is different for different versions. Here are the password file (wand.dat) location for recent versions of Opera. All these information are stored in the encrypted format in wand.dat file. Opera uses Triple-DES algorithm along with static salt data to encrypt these secret information. It comes with Installer so that you can install it locally on your system for regular usage. It has intuitive setup wizard which guides you through series of steps in completion of installation. At any point of time you can use Uninstaller to remove the software from the system. 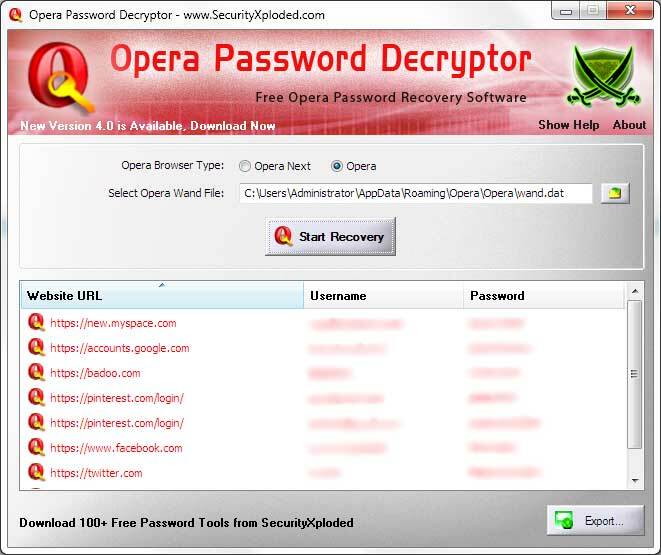 Opera Password Decryptor is the standalone application and it does not require any installation. You can just run it by double clicking on the executable file. Based upon the results, either Opera Next or Opera will be set as default. For New Opera version, it will automatically find and recover the passwords. For older version, you need to select or drag & drop Opera password file. Once selected, click on "Start Recovery" button to recover all the passwords from selected Opera version. Finally you can save all recovered password list to HTML/XML/TXT/CSV file by clicking on 'Report' button and then select the type of file from the drop down box of 'Save File Dialog'. 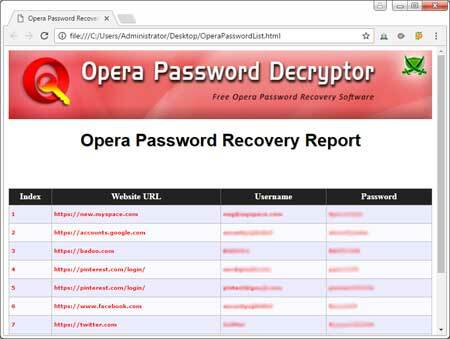 Screenshot 1: Opera Password Decryptor showing the recovered passwords from Opera password store. 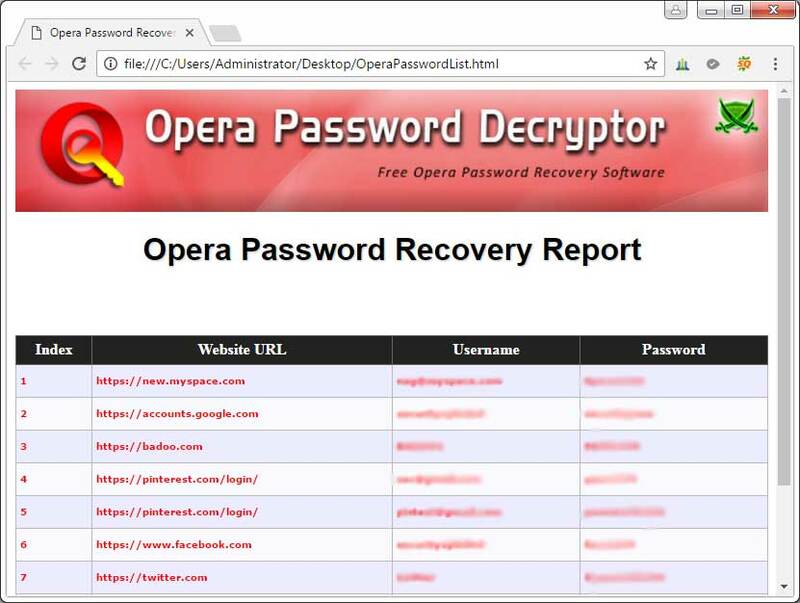 Screenshot 2: Opera recovered password list exported in HTML format by OperaPasswordDecryptor. Mega 2016 edition with the support for new Windows 10 version. Also support for password recovery from latest Opera version. Integrated Uninstaller into Windows Add/Remove Programs, now you can uninstall it in a standard way. Also on dropping of file, now it automatically switches to Opera or Opera Next mode. Major version with a support for Password Recovery from new 'Opera Next' browser. Also added feature to automatically detect Opera Next or Opera password file at the start. Fixed the file verification during Drag & Drop of file. Support for Drag & Drop of Opera Wand File. Fix for Refresh Screen bug, GUI improvements. Critical fix for virus infection problem within the installer. Tested successfully with latest Opera version v12.10. Improved GUI interface with cool banner. New enhanced user interface with cool banner. Export to XML feature - now you can export password report to HTML/XML/Text format. 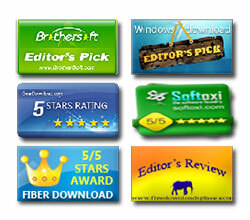 Added 'Setup Wizard' for local Installation & Uninstallation of the software. 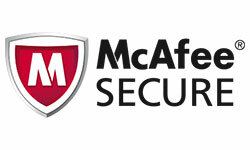 Includes automatic software updater to detect new versions. Also presents catchy GUI interface with new banner. First public release of OperaPasswordDecryptor. Supports recovery of passwords from all versions of Opera across the platforms starting from Windows 2000 to latest operating system Windows 7. 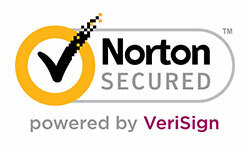 Special thanks to sna@reteam.org for original work on decryption of Opera password file. This tool is based on his great piece of work. Opera Password Decryptor is designed for good purpose to help users to recover the lost Opera account password. Like any tool its use either good or bad, depends upon the user who uses it. However author is not responsible for any damage caused due to misuse of this tool.